Canadian pianist David Braid may not be widely known to most U.S. jazz fans but he is a highly accomplished and respected artist in circles of the jazz community here as well as in Europe. Not to mention, a critical favourite at home. He has recorded nine albums including a recently released solo piano album entitled Verge. 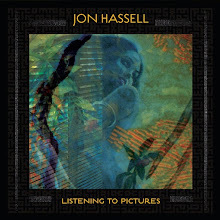 But it's an album he released last year with the legendary Canadian quintet, Canadian Brass called Spirit Dance (Opening Day Records) that is a lyrically beautiful document of two Canadian treasures that has inspired me to write today. While many people may know the Canadian Brass from classical recordings, the group are the perfect compliment for Braid's peaceful piano. Braid's work makes a technical, quiet, and personal statement throughout Spirit Dance . Canadian Brass have joyfulness to their playing that transcends traditional classical pieces. The combination makes for a great blend of the two traditions and an exquisite introduction to both performer and quintet. 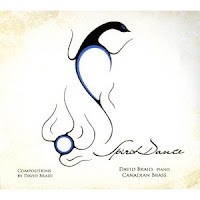 Spirit Dance grew out of the long standing relationship Braid has had with Canadian Brass and the desire the musicians had to work together on a project. These compositions were written by Braid over the course of four years. The opening number "Interior Castles" starts as a melodic free flowing solo piece but builds and modulates after the Brass join in. It continues to keep its lovely harmonic tone and takes you onward to a peaceful conclusion. "Temple Heaven Walk," with its crystalline use of prepared piano and eastern vibe feels like a combination of Stephen Drury's interpretation of John Cage and Jon Hassell's "possible worlds" recordings. The Canadian Brass add an element of mysticism to the piece that elevates it to spiritual level. Many have compared Braid to Bill Evans and Glenn Gould. Bold comparisons, but I do see the similarities in "Resolute Bay" with its deep rolling harmonics and chord changes. The introduction of the quintet in the second half of the piece gives it more of a thematic feel. Mike Herriott and Jeff Nelsen really standout towards the end of "Resolute Bay" as well. "Spirit Dance" moves up and down in a romantic procession. There's a lot going on throughout this piece as it evokes images of great composers like Bernstein and Gershwin. Beautiful, melodic and yet jubilant all at once. "Wash Away," as Braid mentions in the liner notes is the resulting thoughts on what a composition written by Chopin and Ray Charles would sound like. This folks, is brilliant thinking. "Wash Away" has the dominate blues/gospel melody but with a layer of chamber magic added by the Canadian Brass. Spirit Dance turns out to be both a wonderful classical record and melodic solo jazz outing. The compositions are both delicate and improvised within the tradition of great composers from both genres. For those who have never heard David Braid this is great record to start with. For those who thought Canadian Brass were nothing but a classical quintet this is will be a big revelation for you. I've been listening to this record for a few weeks now and everyday new a track pops up as my favourite. I think we all take that as the sign of a great record...right?